For homes that have uneven and irregular openings, like nooks and corners that should be off limits to your precious bundle of joy, the Summer infant Sure and Secure Custom Fit Gate is the perfect answer. This secure and strong safety gate is the best way to restrict your child from entering any corner of your house that you do not feel safe about. 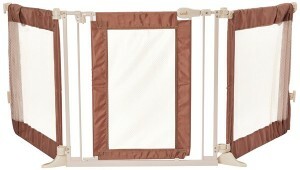 The most unique feature of this particular safety gate is its ability to fit into any irregular openings, such as walls that are not parallel, or around the fireplace or wide opening to the kitchen or garage, etc. Also, because the gate is question is wide, it can be used to separate two large rooms, i.e. separate the living room from the dining room or separate the kitchen from the dining room. Alternatively, the Summer Infant Custom Fit gate can be also used as a playpen for your children, giving them a safe, secured and wide area to play and stay. If you are looking for a larger play pen, purchasing two gates will give your child a sufficient area to play in without making them feel trapped or stifled. The barriers are metal on the borders, with Velcro inside each extension. One part of the gate has the door that can contains a childproof lock that is easy for adults to handle, but not for the children. This particular gate is adjustable and can fit an opening from 70 inch to 141 inch. The opening door can be fit anywhere along the way, according to the convenience of the users and the adults of the house. The adjustable nature of this gate allows the adults to barricade off any uneven or unparallel section of the house according to their need. Besides, the gate is hardware mounted which makes it sturdy and permanent, with no fear of the children or pets managing to get the gate loose. 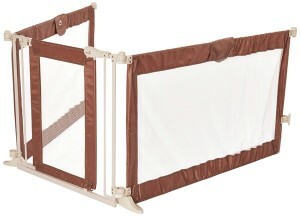 The barriers of the Summer Infant Sure and Secure Gate are made of Velcro, which ensures that the children inside the playpen, or beside the gate, would not get hurt. The door swings both way, and the lock is easy for adults to open with one hand, while keeping the other hand free. The lock, however, is difficult for children and toddlers to manage. Since the barriers are made of Velcro, a mature child – especially one who is 3 years old or more – can learn to open or tear up the part of the Velcro, making the gate useless. Also, many people don’t prefer a hardware mounted gate in their house because installation is permanent and leaves holes in the walls. Drilling holes to mount the gate into the walls means that they cannot be easily transferred to another location, at least not without holes showing on the walls.